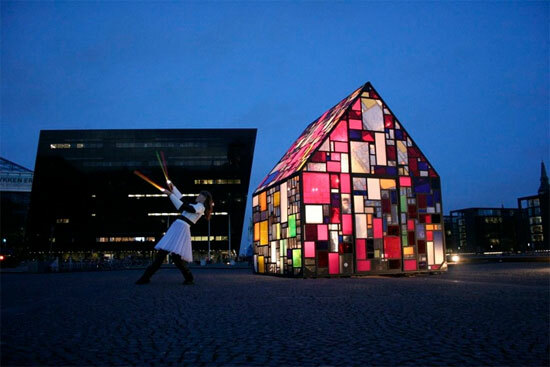 This is Kolonihavehus, an outdoor sculpture created by Tom Fruin and located at the plaza of the Royal Danish Library in Copenhagen. 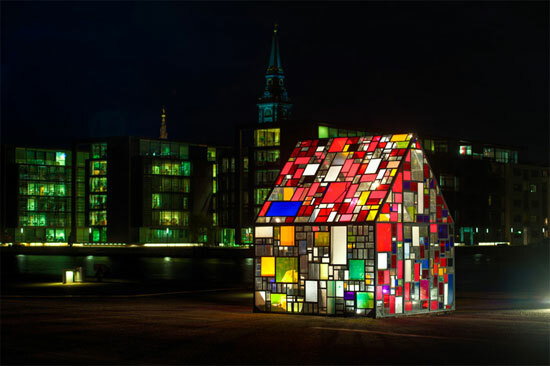 It has the appearance of a friendly and colourful stained-glass house, yet it also evokes thoughts of churches. Kolonihavehuses were originally small garden sheds designed to givea good opportunity for people living in apartments to get away from the crowded city and have fun in the garden. 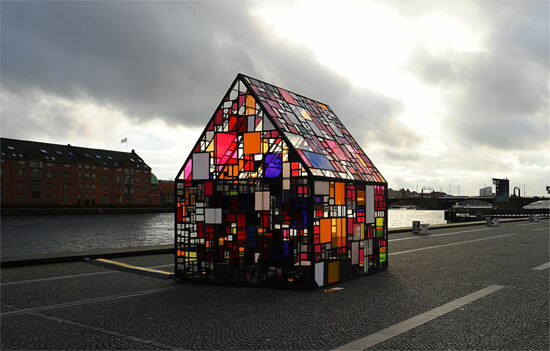 Fruin’s sculpture is constructed of a thousand reclaimed pieces of plexiglass ranging in size from 2×2 to 24×36 inches. The sculpture was brought to life by daily performances by Copenhagen-based CoreAct headed by Anika Barkan and Helene Kvint. The performances included poetry of the Danish Vagn Steen, Computer-controlled light sequences by Nuno Neto and a sound installation by Astrid Lomholt. So if you are around the Black Diamond is the coming weeks, make sure you don’t miss it!